Three Words: Pumpkin. French. Toast. Add a bit of fall flavor to your breakfast with this seasonal Pumpkin French Toast recipe! It's that time of the year where everywhere you look there's bound to be something pumpkin-flavored, whether it's coffee or even ice cream. 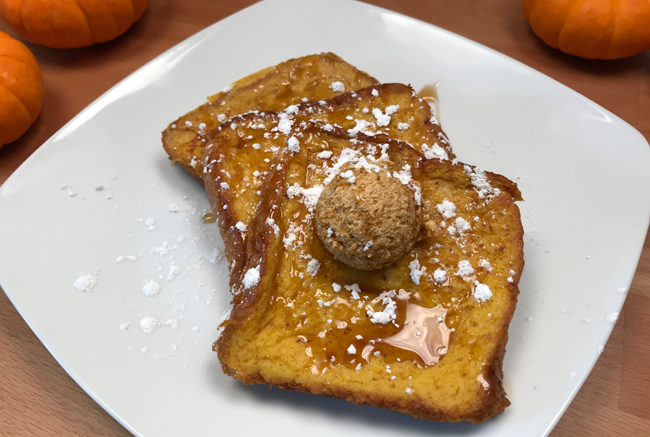 So, to make sure that you're getting into the spirit of the season, we've put together the following Pumpkin French Toast recipe for you to try this fall! In a large bowl, whisk eggs with milk, pumpkin, vanilla extract, pumpkin pie spice, and a pinch of salt. Place bread slices into the pumpkin custard mixture and let soak (5 seconds per side). In a large nonstick skillet over medium-low heat, melt 1 tablespoon butter. Cook 2 slices bread at a time until golden. Repeat to cook all slices. Make pumpkin butter: in a medium bowl, whisk together softened butter with pumpkin, syrup, pumpkin spice, and a pinch of salt until light and fluffy. Top French Toast with pumpkin butter, sprinkle with powdered sugar, and drizzle with syrup. And if you're interested in making Fireball Peaches -- yes, you read that correctly -- click here.